After spending last week on a Mediterranean beach, I am now back to making updates here again! So what have I missed? Well, I recently found out about this project called Adventurer Conqueror King that does look interesting. On the one hand it may seem like yet another OD&D retroclone, but I do like the focus on supporting play across the whole range of levels in the campaign, including what they call "Arnesonian barony building". The scope seems to be wider than many D&D variants out there, perhaps reminiscent of the BECMI approach. Having Blackmoor enthusiast Tavis Alison involved also doesnt hurt from the point of view of this Blackmoor Blog. Read more about the system and how you can help make it come to life here. ACK sounds like Chivalry & Sorcery. It doesn't sound like fun. ACKs doesn't feel like C&S to me, I've downloaded the contributor's draft and it's what I always wanted from D&D in terms of coherent setting creation that infuses all aspects of the campaign. A game with an acronym like "ACK"? Where do I sign up? Thanks for the props, Havard. I didn't realize I had my own tag at your blog, that is pretty cool! 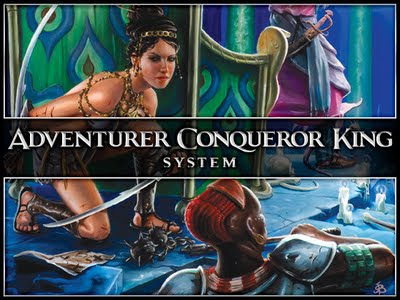 RJ, we liked everything about the name "Adventurer Conqueror King" except the acronym. Adding "System" to the end lets you say ACKS, pronounced like "axe", but as you can see that doesn't always stick. Sean, it's great to hear you confirm that we hit that target. I think the archaeology of the OSR deserves the credit here - trying to guess what people always wanted from D&D would be impossible, except that what we want is implicit in the promise of the early game - we want all the cool things Arneson's players got to do, like domain building and special interests. The traces of all these things are being rediscovered and talked about here & at all the places Havard has in his Community links, so all we had to do was connect the dots. phf, I never played Chivalry & Sorcery, although I did get to make a character once. I think an important difference is that the complexity is front-loaded in C&S, and other games that seek to simulate medieval rulership. In ACKS, the complexity is emergent. We assume that you begin a character by rolling 3d6 in order and going into a dungeon; the pathway to domain management is incremental and built on just supporting each stage of how the characters might spend money to pursue their goals. You might start play with high-level characters and get into stronghold building and domain management right away, but at the same time you might decide that dungeon crawling or wilderness exploration or running a thieves' guild was more fun and never get into "the end game" at all. Providing the tools to do this stuff doesn't mean you have to use them.